One way to increase the aesthetic of your home is to use fencing. Are you moving later this spring? If so, then you are probably looking for ways to make your home your more attractive to potential buyers. 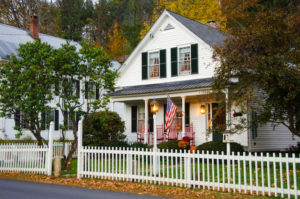 Don’t overlook the value of your home’s curb appeal. One way to increase the aesthetic of your home is to use fencing. Here’s how you can do it. First things first, pick fencing that matches the rest of your home’s look. Whether you’d like the classic picket fence, or something a bit more modern, the choice is yours. Wrought iron and aluminum both make great choices depending on the style of your home. Just be careful not to create an unusual pairing that is unpleasant to look at when possible homebuyers come by to tour the property. When you want to move as quickly as possible, play it safe. Find something conventional and stick with it. That way, your personality won’t outshine the personality of the next homeowner to take over your house. Don’t forget that the fencing around your home isn’t the only thing you have to worry about. You’ll also have to fix up the driveway, make sure the flowers look good and make sure everything else about the front and back of the house looks presentable. In other, think bigger picture. A privacy fence will help you feel more secure. After all, it will help protect you, your family, and your pets. But when you are trying to sell your house, privacy isn’t best. Privacy fencing can be off-putting, but they’ll also make people of secrets. Even the best open house can’t overcome that perception. In this case, you’re better off installing a regular residential fence. This entry was posted on Friday, March 16th, 2018 at 4:11 pm. Both comments and pings are currently closed.